Home » Mazda MX-5 » How Powerful is the new 2019 Mazda MX-5 Miata? The Mazda MX-5 Miata is back for 2019! Mazda recently revealed some information regarding the powertrain of the new Miata, and we’re excited to share the details! The new MX-5 Miata is in its fourth generation and now offers drivers near Lodi, NJ even more power and better performance than ever before! Keep reading to take a closer look at the powertrain and specs of the upcoming 2019 Mazda MX-5 Miata. Check Out Our Inventory of New Mazda MX-5 Miata Models! Mazda engineers have been busy enriching the engine of the new 2019 Mazda MX-5 Miata, which now offers better power and performance for Bergen County drivers. The new SKYACTIV®-G 2.0-liter now boasts 181 horsepower at 7,000 rpm – compare that to the previous year model’s 6,800 rpm; that’s a 17 percent increase from the previous model year! The new Miata even adds seven pounds of weight thanks to the changes and the addition of an aluminum steering shaft (replacing steel). These increased performance numbers are the result of the reduction of internal mass and friction, the reduction of exhaust loss, improved combustion capability, a dual-mass flywheel (that replaces the single-mass flywheel) and a new exhaust system! Also new for 2019, Mazda MX-5 Miata models equipped with an automatic transmission will see an increase in the final drive ratio from 3.454 to 3.583, improving response time. In addition to power and performance, the new 2019 Mazda MX-5 Miata features a newly-available brown canvas soft top, new 17-inch black metallic wheels, refined doors and door stops, an upgraded steering wheel and a host of additional interior enhancements and refinements. 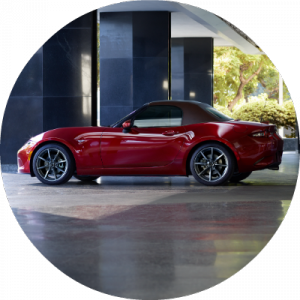 Additionally, new MX-5 Miata models offer a host of standard and available i-ACTIVSENSE safety features, including Traffic Sign Recognition, Smart City Brake Support and more. The 2019 Mazda MX-5 Miata will be available in the U.S. in fall 2018. Contact us to learn more about the new 2019 MX-5 Miata or stop down to Mazda of Lodi and talk to a member of our knowledgeable and friendly team! Schedule a test drive of a new Mazda model at Mazda of Lodi today! This entry was posted on Thursday, July 12th, 2018 at 8:41 pm	and is filed under Mazda MX-5. You can follow any responses to this entry through the RSS 2.0 feed. You can skip to the end and leave a response. Pinging is currently not allowed.